Speaking to attendees before the conference it was obvious that this was going to be a popular session. It seems that most of us are planning, implementing or have launched a responsive design. Josh, Front End Web Developer at Stony Brook University, encouraged the room to think outside the technology box. Asking the big picture question ‘What is your goal in life?’, Josh offered the big picture answer ‘To Serve Others’. Responsive web design ‘serves others’ by putting ourselves in the users’ shoes and seeing what they want. Josh has worked previously with Nikon and advocates strongly for the power of the larger full-width images that we’re using now. The image does carry meaning and can communicate to your user more effectively than text. Thinking ‘mobile first’ isn’t just a cliche. It leads to innovation in copywriting for the web. When you’re thinking of the small screen estate, you think about prioritisation and the flow of users through your content. Offer choices to filter out inappropriate content. Josh emphasises the importance of being honest with ourselves. Are we implementing responsive because it is the hot trend? We should be doing it because it is the right thing to do. Look at your analytics and judge for yourselves whether you need to design for a proliferation of devices. 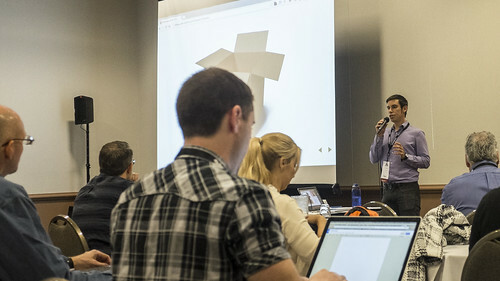 Josh finished his session with a series of solutions for the most common design issues for responsive. Available in his slides, they allow us to resize images and video, maintain the history state in opened accordions and display horizontal tables in a mobile viewport. Smoothscroll can be used to bring opened accordions and anchors to the top of the screen. Josh encourages a positive approach to the inevitable issues that arise in implementing responsive. It’s hard to argue with his assertion that if you’re in a better position today than you were yesterday then you’re moving in the right direction! When entropy is often cited as the natural state of websites, we should embrace the idea of incremental improvements on a daily basis.